Oh my . . . looks like another hormone boosting theme! Can’t say often enough, just what wonderful things Taylor can do to a pair of jeans! I wish Taylor would choose a picture like # 7 for his CD cover. I think it’s much more representative of who he is as a performer and musician than the super- posed and kind of devoid of expression picture I’ve seen floating around lately. But, in today’s blog post I think my heart really belongs to # 8. That’s got to be one of the most hilariously un-manly pictures of Taylor I’ve ever seen. He looks like he’s about to start prancing any minute. #10….. jeans and tongue- what more could a girl ask for on a cold Saturday morning……. I love Taylor best of all in jeans!! Designer suits are nice, but jeans just seem to be the true Taylor! And no body does to a pair of jeans what he does! I love all these pics, they’re great! He works for me! #10 is great as much for Boogie’s face, as Taylor’s! These are great. I like the fitted jeans. The man and his jeans, boy can he wear them!! I have to agree with soulaz, #7 would make a great album cover. Nine is so fine….white shirt and jeans….he is soooo sooo fine. And I think #9 makes a great CD cover. It says it all. Passion, talent, good looks. They are all great but this one with the white shirt and harp speaks album cover to me. 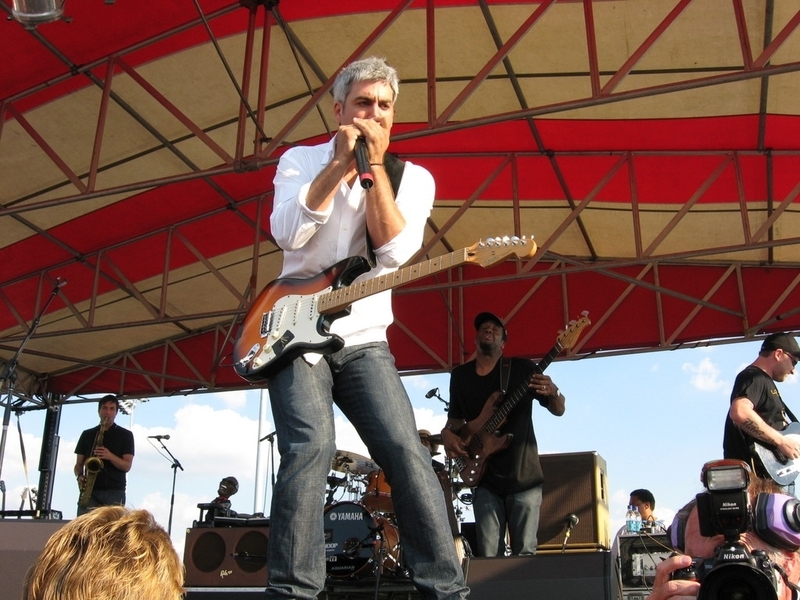 Love me some Taylor Hicks in jeans on a Saturday morning….any morning for that matter…..lol….I believe #9 is from the Kentucky speedway….now that’s an album cover….that’s Taylor. Taylor looks great in jeans. Come to think of it, he looks great in everything. Yep, #7 or 9 would be a great album cover. I love #8 – I think Taylor looks manly even when he’s prancing! #6,7,8 and 9. I would love to see one of them on the new cover. I’m not crazy about the one floating around. But, if it is the one, that’s ok. It just doesn’t look like Taylor to me. Thanks for making my day again. I love all that you do for the Soul Patrol. I would I wake-up each day without Taysunshine. #5 is a winner. Not for the jeans, but for the stance. There’s a lot to read in that body language and I can’t seem to stop scrolling back to it for another look. I pick pictures #1, 2, 3, 4, 5, 6, 7, 8, 9, and 10. #10 … thighs & tongue….I win!! I agree about #7 for the album cover along with #6, 8 or 9. #10, well there’s a lot that can be said about this one besides Yum!!! Mr. Bojeangles, and yes, he can dance. Picture #9 is my favorite today for the harp playing, and for the fact that Al and Ray are inclined in the same direction – nice symmetry! I agree with Soulaz because #7 is Taylor the singer/performer. Some of these Jean pics show more breaking out than others! But if I go by fabric and color, I like the #9 jeans. Did I ever tell you how attractive I find narrow hipped men in jeans ? They’re all great, but I’m digging #4 ALOT. Standing tall, that’s ONE fine, TALL drink of water! Lap it up… Yes, indeed. 7, 8 and 9 for me today. Wow. I love how he is getting his “shhhh” on in #8. LOL I hear it in my head even now. First of all, soulaz-you got me in trouble because what you wrote about photo 8 made me burst out laughing and I scared the dog who ran around barking which made my husband yell, “What the hell is going on?” which caused both sons to poke their heads out of their bedrooms and ask if we were being raided. OK, that’s a minor exaggeration, but I DID laugh out loud. I SO agree about that photo that may be the new CD cover. What do I know, but I think it would serve Taylor well to have an album cover that shows more of who he is as a musician. With that in mind, I vote for Photo 9 because he’s playing his trademark harp but he’s also got the guitar strapped on and ready to fly. Jeans instead of a suit because he looks more youthful and playful and well, ya know. Kinda hot. Um #10…..spank me. ‘Nuff said. No one can work a pair of jeans the way this man can. GAH! The one of him in the black t-shirt…..YUM! I’ve been coming to RHS since its inception. I’ve enjoyed every offering and every comment. But Tays has outdone herself today. Taylor’s hotness in jeans is a given (#1, #2, & #10 – can I get a witness.) But its the VARIETY of Taylor posturing and performance moods that has me in a fit of fluster. To me, this 10 shot grouping is amazing because of it’s “into the music” moments and I’ve saved them as such. Bravo Tays! Dummmmm question….. where was #7 taken that he was using a corded mic? I was going to say that #2 would be another great poster, but I agree with all about #7 for a CD cover. I still love the glimpses of Elvis that surface, now and then (it’s the age), and #7 has that. #9 is perfect! Thanks for giving us all of these! As always, they are all wonderful pictures. I studied #2 for a bit before moving on! Love #8 and also clearly hear the “SHHHHH!” #9 is bright, eye-catching and very much Taylor Hicks. #10 is ……uh uh uh…no comment! Man, that boy and his thighs really know how to fill out a pair of jeans!!!!!!!!!!! In a word…. WOW. Sallyannlady — in answer to your question about the corded mic….that was in Branson Missouri. I didn’t go to that show but from what I heard, they were having multiple sound problems that night, particularly with Taylor’s mic. Finally he switched to a corded mic. Love all of the jeans pictures, but #7 & #9 I had to look a few times at! But… I love them all; I LOVE the subject! OK, for me, #’s 7 & 9 are perfection. I love the energy of the hard-working musician in 7 and the white shirt and dark jeans in 9 are well, as I said before, perfection! All I can say is When will Taylor be in a jeans commercial?? How about Diesel? If Brett F can do it for Wrangler…Taylor would be a perfect candidate for a younger jeans company…he can certainly fill them out and show them off. I think everyone needs to take a long hard look at #9!